The talented Mr Myles Hamilton-Fey will be appearing at the Crewe Lyceum from 13th – 17th November 2018. There are two performances, matinee at 2.30pm and evening at 7.30pm. Myles, son of Joanne who has been part of the Jacksons team for over 30 years, is in year 10 and embarking upon his GCSEs which not surprisingly includes Drama. 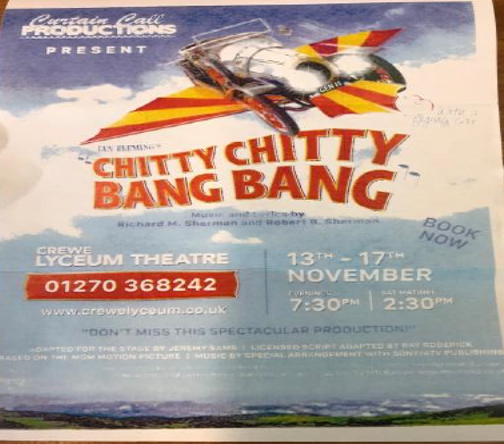 Lots of you will have had a flyer for Chitty in your reminders. These productions, I believe, cost a fortune to stage so please pop long and support Myles and the company if you can.